Valentine’s Day came and went in the Big Mango in a manner that would make you forget that the holiday is an American import. On the Skytrain, ladies carried roses from their lovers. In the mall, men swamped the chocolate counters, leaving shelves nearly bare. This is one import that has grabbed the hearts of Thais. For our Valentine’s celebration, Tawn and I traveled to the old city to watch a film. The annual French-Thai cultural festival la fête presented a screening of the French romantic comedy Le Fabuleux Destin d’Amélie Poulain by Jean-Pierre Jeunet. The screening was held outdoors, on the lawn behind Museum Siam. The setting was gorgeous, the weather perfect, and eating a picnic of salami and goat cheese sandwiches, grilled vegetables, olives, and chocolate cake with ice cream (the cooling wonders of dry ice!) was the perfect way to spend the evening. A brief video to show you the lay of the land just as the show was starting. This entry was posted in Uncategorized and tagged Amelie, day, Festival, Fete, Film, La Fete, Outdoor, Picnic, Screening, Valentine, Valentine's by christao408. Bookmark the permalink. 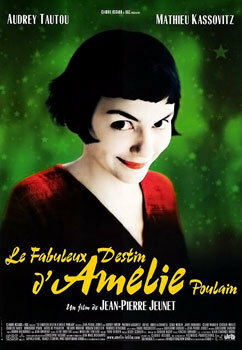 I’ve always wanted to see Amelie. I’ll definitely have to rent it someday soon! hope u hv had a great one!! Wow, you & Tawn did have a perfect Valentine evening! I noticed that Philippines & Thailand had so much in common. The Filipinos celebrated Valentine’s Day watching Valentine concerts, lunch or dinner dates, and of course, flowers and chocolates are always part of it. Back here in Taiwan, I didn’t feel any romantic atmosphere. awww love love loveee!!!! honestly chris. one of the things i love da most about you and hubby is that you both appreciate “simplicity” = know how to enjoy life (quality of life). a nice home cook meal. an outdoor movie w/ your homemade picnic basket etc. who says… good quality of life = spending lots of money?! it doesn’t have to be extravagant….. ::sigh:: it’s just simply wonderful. i heart u both so much! hope you had a lovely and fun v-day! What a nice way to spend the night outdoors under the Bangkok night sky. How much was the admission? Just curious. Looks like the perfect setting for a romantic evening. And as for Valentines, it is one export which the whole world seems to love. Ah a romantic evening together under the stars! Can I hire you to pack my next picnic?!? I loved the first Amelie movie (we saw it together I believe). Will look for this one to be in Indianapolis and make a point of seeing it. I love her love of life. love love love love more and i agree… besides, $20 is for 2 ppl; yes mayb a lil pricey but imagine living in da states w/ hubby and how much more that experience will cost you cost of living/traffic/awful weather (guess it depends on where you live) etc. anywayyyy…. it’s not entirely about money if you know what i mean PROPS to “Joie de vivre and all that” xoxoxohttp://1000awesomethings.com/ – truly an inspiration… to me. just like u. @jandsschultz – This is actually the same film. The title I used is the full name of the film as it appears in the French release. Sadly, there is no sequel. What a lovely rormantic setting. Valentines is the next big hype of commercialism after Christmas. Isn’t that movie so beautiful. I think I watched it twice. Now that’s a nice way to enjoy a movie on Valentine’s day. Chris,First off, amazing post. I never get tired of any of them. You get so many followers and feedback from your posts; just how do you do it? Any words of advice? @Swiftonik – I’m glad you enjoy the posts; thanks for your comment. Over time, I’ve built up a modest following mostly by spending a lot of time reading and commenting on other people’s blogs. Unfortunately, it has gotten to the size where it is hard to follow up with everyone’s blogs anymore. But that process of building connections has helped me make many Xanga friends. @ElusiveWords – And the fact that the weather was quite decent after a warm day was a very pleasant surprise! @ZSA_MD – Well, in a capitalist society there isn’t anything that we won’t attempt to commercialize. But we each have the ability to put a limit on how commercial we’ll let something become. @icepearlz – There’s a fair number of outdoor film screenings that happen in the city, mostly in the winter months. I’d like to see more of them occur as I think it is a fun way to enjoy a film. @Swiftonik – Chris’s advice is spot on. Find blogs that you like, subscribe to them, comment on them and eventually people will start to notice you. Post regularly if possible, I find this to be challenging. If a comment on one of your favorite blogs catches your eye, check out who wrote it and if you like their blog, subscribe to it. Over time, you’ll start to build a decent size of subscribers. Good luck.